Gyeonggi police searched South Korean singer-actor Park Yoo-chun’s home and took hair samples Tuesday in a drug probe that started when his ex-girlfriend accused him of using illegal drugs. The Gyeonggi Nambu Provincial Police Agency drug squad said 11 investigators had raided Park’s residence in Hanam, Gyeonggi Province, and confiscated his cellphone and car, a day before Park’s scheduled appearance for police questioning Wednesday. In spite of Park’s denials, police found his ex-girlfriend’s testimony credible after obtaining surveillance camera footage from her former residence in Gangnam taken earlier this year showing Park on the premises. During the police investigation, Park’s ex-girlfriend Hwang Ha-na testified that she and Park had used drugs together earlier this year at her home and also alleged that Park had injected her with methamphetamine while she was asleep. Hwang, the granddaughter of the founder of a leading South Korean dairy company, was arrested earlier this month on charges of illegal drug use, and the prosecution has taken over her case. Hwang and Park announced their engagement in April 2017, but broke up in September of the same year. “Park Yoo-chun will voluntarily appear at the Gyeonggi Provincial Police Agency at 10 a.m. on April 17 for police questioning. 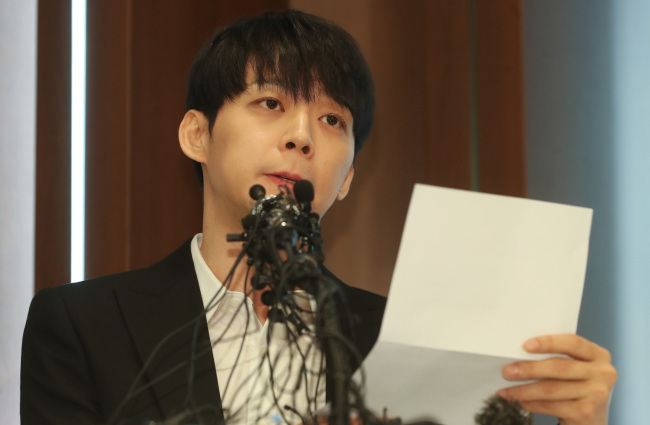 Although Park Yoo-chun has already said that he has not used drugs in the press conference held on April 10, he will sincerely undergo police investigation,” said Park’s legal representative Kwon Chang-bum. Park has said Hwang threatened him after their breakup. Police confirmed Park tested negative for drug use in a preliminary test, but Park’s hair and urine samples have been sent to the National Forensic Service for further tests. It takes about three weeks for the NFS to screen the samples. The latest case involving Hwang, who has made a name for herself as a social media influencer with a lavish lifestyle, has prompted a new wave of public anger against the police for what many viewed as lenient treatment of Hwang when she was the subject of an earlier drug investigation in 2015. The prosecution faces fierce backlash for dropping charges against Hwang in 2015, even though an undergrad student surnamed Cho who had used drugs with Hwang was sentenced in 2016 to two years and six months in prison, suspended for three years.